Latrigg at 368m (1207ft) is one of the lowest fells in the Lake District but very popular due to its location overlooking Keswick and its views down the valley of Borrowdale from the summit. The southern slopes of Latrigg are partially wooded but one prominent lone tree just to the south of the summit can be seen in silhouette when approaching Keswick from the west on the A66. The stumps at the top of the southern slope are evidence of deforestation and along with the summit has now become sheep pasture. Skiddaw is Latrigg’s parent peak which rises northwards to 931 metres. The car park at the end of Gale Road is mostly used as the starting point for the ascent of Skiddaw but a recently constructed path from the car park allows disabled access to the summit of Latrigg. The Cockermouth, Keswick and Penrith Railway line which opened on 2nd January 1865 was 31½ miles long and had eight intermediate stations. The 18 miles of the line between Penrith and Keswick included 78 bridges. The line full closed in June 1972 and now many sections of the route have been made into a cycle and walking route. The Keswick Railway Footpath between Keswick and Threlkeld was created by the Lake District National Park Authority. The 3 mile scenic route through the Greta Gorge from Keswick Station to Threlkeld Station has a series of eight impressive bridges crossing over the River Greta. It is well maintained and mostly level apart from a short stretch underneath the A66 viaduct where the line used to go through a tunnel and there are information plaques at various points along the route. It is an easy trail through lovely countryside and combined with a wide variety of natural and man-made features it makes an attractive and stimulating walk with something of interest for everyone. The caterpillars we found on a tree near the old railway line develop into Ermine Moths. The moths lay their eggs on plants, shrubs and trees that their caterpillars can feed on when they hatch. Thousands of caterpillars then weave a thick white silk web over the entire plants, shrubs and trees and also over themselves for protection from predators and parasites. The caterpillars then gorge themselves on the plants and trees under their cocoon before pupating into moths. There are many species of Ermine Moths most of them in the tropics. From the Leisure Centre car park we walk forwards to the small roundabout and turn left up Brundholme Road. At the junction on the brow we turn right and almost immediately left to take the path following the road with the field on our right. When we reach the road (Briar Rigg) we turn right and walk on the pavement. Just past the post box we turn right onto the Cumbria Way sign posted Public Bridle Way Skiddaw 4 miles. We cross over the A66 via the bridge and keep heading forwards following the track uphill through a gate, past an information board and into the trees. We eventually cross a stream and through a gate and bear right past another information board. When we reach the signpost, Public Footpath Latrigg Summit ¾ mile, we turn right going back on ourselves. We follow the track zigzagging uphill until we arrive at a seat. The views of Keswick, Derwent Water and into the Borrowdale valley are amazing. We turn left still going uphill to the top and then head downhill through a gate and keep heading downhill bearing slightly left towards the trees and a fence. We turn right along the track following the fence on our left and then head downhill on a track between some trees and bushes until we come to a gate. We go through the gate and turn left through a gateway and follow the tarmac track going through another gateway and past a house on the right. We just keep following the track down to the bottom then turn right through a gate and make our way to the old railway line. At the railway line there is an information hut we turn right and follow the old line which is a cycle and walking route alongside the River Greta. We cross over three bridges over the river then through an archway under the road and keep heading forwards to a wall and a picnic table and then follow the walkway to the right. We go under the A66 and then through another archway under the road. We head forwards to cross over the road and river bridge and keep heading forwards passing the old railway station back to the car park. 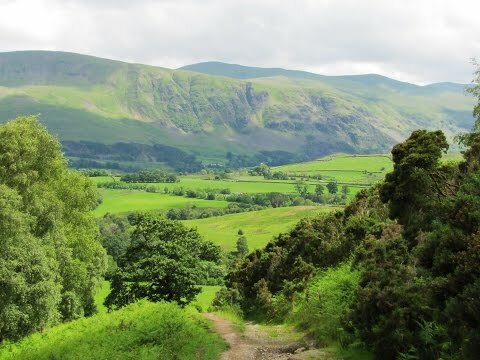 This is a moderate walk on good well walked paths and tracks with steep inclines to Latrigg but a steady decline to the old railway line. Elevation: Approx lowest point 89.80m (294.62ft) approx highest point 366.70m (1203.08ft). Approx 5.7 miles allow 2½ – 3 hours using OS Explorer Map OL4, The English Lakes North – Western area. Start Point: Car park at the Leisure Centre. Parking: There are six pay and display car parks, the car park at the Leisure Centre (soon to become a pay and display) and some free back street parking. There are public toilets at the Leisure Centre and in the car park at the back of the Market Place near the centre of Keswick and also at the Theatre by the Lake. For refreshments there are ample shops, bakeries, cafes, take-away and pubs to choose from in Keswick1.